Cooper S trim. CARFAX 1-Owner, GREAT MILES 4,503! FUEL EFFICIENT 32 MPG Hwy/23 MPG City! Sunroof, iPod/MP3 Input, Onboard Communications System, Smart Device Integration, SIGNATURE LINE PACKAGE, Turbo, Back-Up Camera. CLICK ME! KEY FEATURES INCLUDE Back-Up Camera, Turbocharged, iPod/MP3 Input, Onboard Communications System, Smart Device Integration. MINI Cooper S with Solaris Orange metallic exterior and Carbon Black Leatherette interior features a 4 Cylinder Engine with 189 HP at 4400 RPM*. OPTION PACKAGES SIGNATURE LINE PACKAGE Transmission: Sport Automatic, JCW Leather Steering Wheel, Automatic Climate Control, Active Driving Assistant, All-Season Tires, Panoramic Moonroof, Piano Black Interior Surface, Wheels: 17 x 7.0 Tentacle Spoke Silver Alloy Style 500, Tires: 205/45R17, Comfort Access Keyless Entry. Rear Spoiler, MP3 Player, Steering Wheel Controls, Heated Mirrors, Electronic Stability Control. WHO WE ARE MINI of Manhattan Adventure Starts Here Horsepower calculations based on trim engine configuration. Fuel economy calculations based on original manufacturer data for trim engine configuration. Please confirm the accuracy of the included equipment by calling us prior to purchase. Cooper trim. FUEL EFFICIENT 32 MPG Hwy/22 MPG City! ONLY 2,204 Miles! Moonroof, Heated Seats, Back-Up Camera, iPod/MP3 Input, All Wheel Drive, ALL-SEASON TIRES, SIGNATURE TRIM, Turbo Charged. SEE MORE! KEY FEATURES INCLUDE All Wheel Drive, Back-Up Camera, Turbocharged, iPod/MP3 Input. MINI Cooper with White Silver metallic exterior and Carbon Black Leatherette interior features a 3 Cylinder Engine with 134 HP at 4400 RPM*. OPTION PACKAGES SIGNATURE TRIM Wheels: 17 x 7.5 Vent Spoke Silver Alloy Style 518, Connected Media System w/6.5 Touchscreen, Transmission: 8-Speed Steptronic Automatic, Heated Front Seats, Automatic Climate Control, Active Driving Assistant, Panoramic Moonroof, Piano Black Interior Surface, MINI Excitement Package, Comfort Access Keyless Entry, ALL-SEASON TIRES. Rear Spoiler, MP3 Player, Child Safety Locks, Steering Wheel Controls, Heated Mirrors. VISIT US TODAY MINI of Manhattan Adventure Starts Here Horsepower calculations based on trim engine configuration. Fuel economy calculations based on original manufacturer data for trim engine configuration. Please confirm the accuracy of the included equipment by calling us prior to purchase. ONLY 2,314 Miles! FUEL EFFICIENT 30 MPG Hwy/21 MPG City! Moonroof, Heated Seats, iPod/MP3 Input, Back-Up Camera, Brake Actuated Limited Slip Differential, Smart Device Integration, SIGNATURE TRIM, ALL-SEASON TIRES SEE MORE! KEY FEATURES INCLUDE All Wheel Drive, Back-Up Camera, Turbocharged, iPod/MP3 Input, Dual Moonroof, Aluminum Wheels, Smart Device Integration, Brake Actuated Limited Slip Differential. MINI Cooper S with Island Blue metallic exterior and Carbon Black Leatherette interior features a 4 Cylinder Engine with 189 HP at 5000 RPM*. OPTION PACKAGES SIGNATURE TRIM Connected Media System w/6.5 Touchscreen, Transmission: Sport Automatic, Dynamic Damper Control, Active Driving Assistant, Comfort Access Keyless Entry, Heated Front Seats, Automatic Climate Control, MINI Driving Modes, JCW Leather Steering Wheel, Piano Black Interior Surface, MINI Assist eCall, MINI TeleServices, ALL-SEASON TIRES. MP3 Player, Steering Wheel Controls, Heated Mirrors, Electronic Stability Control, Bucket Seats. WHO WE ARE MINI of Manhattan Adventure Starts Here Horsepower calculations based on trim engine configuration. Fuel economy calculations based on original manufacturer data for trim engine configuration. Please confirm the accuracy of the included equipment by calling us prior to purchase. Cooper trim. ONLY 1,933 Miles! FUEL EFFICIENT 37 MPG Hwy/28 MPG City! Heated Seats, Sunroof, Onboard Communications System, Smart Device Integration, iPod/MP3 Input, SIGNATURE LINE PACKAGE, Turbo, Back-Up Camera. READ MORE! KEY FEATURES INCLUDE Back-Up Camera, Turbocharged, iPod/MP3 Input, Onboard Communications System, Smart Device Integration MINI Cooper with Starlight Blue Metallic exterior and Carbon Black Leatherette interior features a 3 Cylinder Engine with 134 HP at 4400 RPM*. OPTION PACKAGES SIGNATURE LINE PACKAGE Wheels: 16 x 6.5 Loop Spoke Silver Alloy Style 494, Tires: 195/55 R16, Transmission: 6-Speed Automatic w/STEPTRONIC, Heated Front Seats, White Turn-Signal Lights, Automatic Climate Control, All-Season Tires, Panoramic Moonroof, Piano Black Interior Surface, MINI Excitement Package, Comfort Access Keyless Entry. Rear Spoiler, MP3 Player, Child Safety Locks, Steering Wheel Controls, Heated Mirrors. 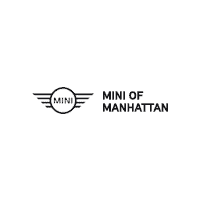 OUR OFFERINGS MINI of Manhattan Adventure Starts Here Horsepower calculations based on trim engine configuration. Fuel economy calculations based on original manufacturer data for trim engine configuration. Please confirm the accuracy of the included equipment by calling us prior to purchase. GREAT MILES 1,801! EPA 30 MPG Hwy/21 MPG City! Sunroof, Heated Seats, iPod/MP3 Input, All Wheel Drive, Back-Up Camera, Turbo, LED HEADLIGHTS W/CORNERING LIGHTS, JCW LEATHER STEERING WHEEL, SIGNATURE TRIM, ALL-SEASON TIRES CLICK ME! KEY FEATURES INCLUDE All Wheel Drive, Back-Up Camera, Turbocharged, iPod/MP3 Input. MINI Cooper S with British Racing Green metallic exterior and Carbon Black Leatherette interior features a 4 Cylinder Engine with 189 HP at 5000 RPM*. OPTION PACKAGES SIGNATURE TRIM Connected Media System w/6.5 Touchscreen, Wheels: 17 x 7.5 Net Spoke Black Alloy Style 519, Tires: 225/45 R17, Transmission: Sport Automatic, Dynamic Damper Control, Heated Front Seats, MINI Driving Modes, Automatic Climate Control, Active Driving Assistant, Panoramic Moonroof, Piano Black Interior Surface, Comfort Access Keyless Entry, LED HEADLIGHTS W/CORNERING LIGHTS LED Fog Lights, JCW LEATHER STEERING WHEEL, ALL-SEASON TIRES. Rear Spoiler, MP3 Player, Steering Wheel Controls, Child Safety Locks, Electronic Stability Control. OUR OFFERINGS MINI of Manhattan Adventure Starts Here Horsepower calculations based on trim engine configuration. Fuel economy calculations based on original manufacturer data for trim engine configuration. Please confirm the accuracy of the included equipment by calling us prior to purchase. EPA 32 MPG Hwy/23 MPG City! ONLY 2,528 Miles! Cooper S trim. Sunroof, iPod/MP3 Input, Onboard Communications System, Smart Device Integration, SIGNATURE LINE PACKAGE, Turbo Charged, Back-Up Camera. READ MORE! KEY FEATURES INCLUDE Back-Up Camera, Turbocharged, iPod/MP3 Input, Onboard Communications System, Smart Device Integration MINI Cooper S with Chili Red exterior and Carbon Black Leatherette interior features a 4 Cylinder Engine with 189 HP at 4400 RPM*. OPTION PACKAGES SIGNATURE LINE PACKAGE Transmission: Sport Automatic, JCW Leather Steering Wheel, Automatic Climate Control, Active Driving Assistant, All-Season Tires, Panoramic Moonroof, Piano Black Interior Surface, Wheels: 17 x 7.0 Tentacle Spoke Silver Alloy Style 500, Tires: 205/45R17, Comfort Access Keyless Entry. Rear Spoiler, MP3 Player, Steering Wheel Controls, Heated Mirrors, Electronic Stability Control. WHY BUY FROM US MINI of Manhattan Adventure Starts Here Horsepower calculations based on trim engine configuration. Fuel economy calculations based on original manufacturer data for trim engine configuration. Please confirm the accuracy of the included equipment by calling us prior to purchase. LOW MILES - 1,490! Cooper trim. FUEL EFFICIENT 38 MPG Hwy/28 MPG City! Sunroof, iPod/MP3 Input, Onboard Communications System, Smart Device Integration, SIGNATURE LINE PACKAGE, Turbo, Back-Up Camera. CLICK ME! KEY FEATURES INCLUDE Back-Up Camera, Turbocharged, iPod/MP3 Input, Onboard Communications System, Smart Device Integration MINI Cooper with Starlight Blue Metallic exterior and Carbon Black Leatherette interior features a 3 Cylinder Engine with 134 HP at 4400 RPM*. OPTION PACKAGES SIGNATURE LINE PACKAGE Wheels: 16 x 6.5 Loop Spoke Silver Alloy Style 494, Tires: 195/55 R16, Transmission: 6-Speed Automatic w/STEPTRONIC, White Turn-Signal Lights, Automatic Climate Control, All-Season Tires, Panoramic Moonroof, Piano Black Interior Surface, MINI Excitement Package, Comfort Access Keyless Entry. Rear Spoiler, MP3 Player, Steering Wheel Controls, Electronic Stability Control, Heated Mirrors. BUY FROM AN AWARD WINNING DEALER MINI of Manhattan Adventure Starts Here Horsepower calculations based on trim engine configuration. Fuel economy calculations based on original manufacturer data for trim engine configuration. Please confirm the accuracy of the included equipment by calling us prior to purchase. Cooper S trim. ONLY 1,688 Miles! FUEL EFFICIENT 32 MPG Hwy/23 MPG City! Sunroof, iPod/MP3 Input, Onboard Communications System, Smart Device Integration, SIGNATURE LINE PACKAGE, Turbo, Back-Up Camera. READ MORE! KEY FEATURES INCLUDE Back-Up Camera, Turbocharged, iPod/MP3 Input, Onboard Communications System, Smart Device Integration MINI Cooper S with Solaris Orange metallic exterior and Carbon Black Leatherette interior features a 4 Cylinder Engine with 189 HP at 4400 RPM*. OPTION PACKAGES SIGNATURE LINE PACKAGE Transmission: Sport Automatic, JCW Leather Steering Wheel, Automatic Climate Control, Active Driving Assistant, All-Season Tires, Panoramic Moonroof, Piano Black Interior Surface, Wheels: 17 x 7.0 Tentacle Spoke Silver Alloy Style 500, Tires: 205/45R17, Comfort Access Keyless Entry. Rear Spoiler, MP3 Player, Steering Wheel Controls, Heated Mirrors, Electronic Stability Control. MORE ABOUT US MINI of Manhattan Adventure Starts Here Horsepower calculations based on trim engine configuration. Fuel economy calculations based on original manufacturer data for trim engine configuration. Please confirm the accuracy of the included equipment by calling us prior to purchase. GREAT MILES 1,286! EPA 38 MPG Hwy/28 MPG City! Cooper trim. Sunroof, iPod/MP3 Input, Onboard Communications System, Smart Device Integration, SIGNATURE LINE PACKAGE, Turbo, Back-Up Camera. AND MORE! KEY FEATURES INCLUDE Back-Up Camera, Turbocharged, iPod/MP3 Input, Onboard Communications System, Smart Device Integration. MINI Cooper with Chili Red exterior and Carbon Black Leatherette interior features a 3 Cylinder Engine with 134 HP at 4400 RPM*. OPTION PACKAGES SIGNATURE LINE PACKAGE Wheels: 16 x 6.5 Loop Spoke Silver Alloy Style 494, Tires: 195/55 R16, Transmission: 6-Speed Automatic w/STEPTRONIC, White Turn-Signal Lights, Automatic Climate Control, All-Season Tires, Panoramic Moonroof, Piano Black Interior Surface, MINI Excitement Package, Comfort Access Keyless Entry. Rear Spoiler, MP3 Player, Steering Wheel Controls, Electronic Stability Control, Heated Mirrors. MORE ABOUT US MINI of Manhattan Adventure Starts Here Horsepower calculations based on trim engine configuration. Fuel economy calculations based on original manufacturer data for trim engine configuration. Please confirm the accuracy of the included equipment by calling us prior to purchase. LOW MILES - 960! FUEL EFFICIENT 32 MPG Hwy/23 MPG City! Cooper S trim. Sunroof, iPod/MP3 Input, Onboard Communications System, Smart Device Integration, SIGNATURE LINE PACKAGE, Turbo, Back-Up Camera. CLICK ME! KEY FEATURES INCLUDE Back-Up Camera, Turbocharged, iPod/MP3 Input, Onboard Communications System, Smart Device Integration MINI Cooper S with Starlight Blue Metallic exterior and Carbon Black Leatherette interior features a 4 Cylinder Engine with 189 HP at 4400 RPM*. OPTION PACKAGES SIGNATURE LINE PACKAGE Transmission: Sport Automatic, JCW Leather Steering Wheel, Automatic Climate Control, Active Driving Assistant, All-Season Tires, Panoramic Moonroof, Piano Black Interior Surface, Wheels: 17 x 7.0 Tentacle Spoke Silver Alloy Style 500, Tires: 205/45R17, Comfort Access Keyless Entry. Rear Spoiler, MP3 Player, Steering Wheel Controls, Heated Mirrors, Electronic Stability Control. MORE ABOUT US MINI of Manhattan Adventure Starts Here Horsepower calculations based on trim engine configuration. Fuel economy calculations based on original manufacturer data for trim engine configuration. Please confirm the accuracy of the included equipment by calling us prior to purchase. LOW MILES - 3,297! FUEL EFFICIENT 30 MPG Hwy/21 MPG City! Heated Seats, Sunroof, iPod/MP3 Input, Back-Up Camera, Brake Actuated Limited Slip Differential, Smart Device Integration, SIGNATURE TRIM, ALL-SEASON TIRES, Turbo AND MORE! KEY FEATURES INCLUDE All Wheel Drive, Back-Up Camera, Turbocharged, iPod/MP3 Input, Dual Moonroof, Aluminum Wheels, Smart Device Integration, Brake Actuated Limited Slip Differential MINI Cooper S with Light White exterior and Carbon Black Leatherette interior features a 4 Cylinder Engine with 189 HP at 5000 RPM*. OPTION PACKAGES SIGNATURE TRIM Connected Media System w/6.5 Touchscreen, Transmission: Sport Automatic, Dynamic Damper Control, Active Driving Assistant, Comfort Access Keyless Entry, Heated Front Seats, Automatic Climate Control, MINI Driving Modes, JCW Leather Steering Wheel, Piano Black Interior Surface, MINI Assist eCall, MINI TeleServices, ALL-SEASON TIRES. MP3 Player, Steering Wheel Controls, Heated Mirrors, Electronic Stability Control, Bucket Seats. WHO WE ARE MINI of Manhattan Adventure Starts Here Horsepower calculations based on trim engine configuration. Fuel economy calculations based on original manufacturer data for trim engine configuration. Please confirm the accuracy of the included equipment by calling us prior to purchase.